The earliest archeological dating of lentils is from the Paleolithic and Mesolithic layers of Franchthi Cave in Greece (13,000 to 9,500 years ago) and from the end-Mesolithic at Mureybit and Tell Abu Hureya in Syria, and about 8000 B.C. in the Jericho area of Palestine. Other remains come from �ayon�, Turkey dated at 6700 B.C and the many other sites in the Middle and Near East. The lentil was an important crop in ancient times and the size of its seeds have slowly increased since classical times. Lentils are a plant associated with the Old World agricultural revolution in prehistoric times that was domesticated along with einkorn and emmer wheats, barley, pea, and flax. 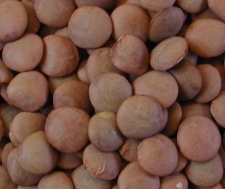 Lentils were also spread with Neolithic agriculture to Greece and Bulgaria. Then it spread, with wheat and barley, into the Bronze Age agriculture of the Near East and Mediterranean. The lentil played a role with the Jews as we know from the story of Esau who gave up his birthright for a dish of lentils (Genesis 25: 30-34). The ancient Greeks very much enjoyed lentils, especially in soups. Aristophanes said "You, who dare insult lentil soup, sweetest of delicacies." The Greeks also made lentils into bread. Pliny describes the growing of lentils from seed and its varieties. He mentions its medicinal properties and a variety of ways of boiling or otherwise cookings lentils for various remedies. Both Roman writers Juvenal and Martial describe a lentil dish eaten by the poor called conchis in which lentils were cooked with the pods. Apicius has several recipes for lentils. In the sixth century, Anthimus says lentils should be cooked slowly, and once they are cooked a little vinegar should be added for flavor, along with Syrian sumac. It's served with olive oil and whole coriander and some salt.